Starting today, this blog will officially be updated on a weekly basis. This is a small step up in terms of how often I’m posting now, but it’s something I want to try. After all, it’s a new year and that’s a great time to experiment with new ways of doing things — as I’m not an experienced blogger (at all) I haven’t really nailed down any good content-producing habits, and I think the best way for me to do so will be to get into a bit of a groove by sticking to a fixed schedule. 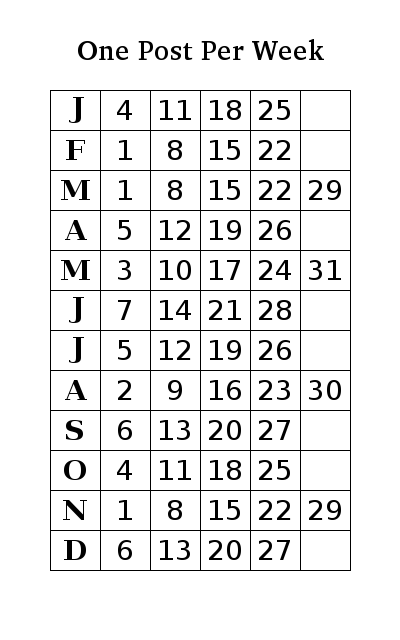 The first column lists the first letter of each month, and the numbers on each row are the dates of all Mondays in the corresponding month for 2010. So the first row, for example, shows that the Mondays in January fall on the 4th, 11th, 18th and 25th. These are all the days on which there will be a new post. When I have a new post done and set to publish automatically, I’ll mark the matching Monday square in green. When I miss a day (though the plan is that I won’t) I’ll mark the matching square in red. This way I’ll have a very clear history of when I did and didn’t meet my deadline. The purpose of this table is purely motivational. Having it next to my desk gives me a noticeable reminder if I still haven’t finished the next Monday’s post, and marking past Mondays in green (for done) and red (for missed) will give me a very frequent reminder that I’m either doing well or falling behind. Are you trying anything new this year? Would a visual aid help you stay on track?